How many times have you looked at that dead servo on the corner of your bench and wished that you did not have to buy another? I had 6 dead servo's that I picked up cheap through E-Bay, all were mechanically sound, it appeared that the previous owner had fried them with too much supply voltage. They were a mixture of Futaba, Hitec and Acoms servo's. After stripping them all to check that they were ok mechanically, I looked through my other servo's for one the had the simplest circuit to replicate, this ended up being the GWS Premium Servo. The main reason for this was that the components were easy to get in Australia. I tested the GWS Circuit with all the servo's first to check that it worked. 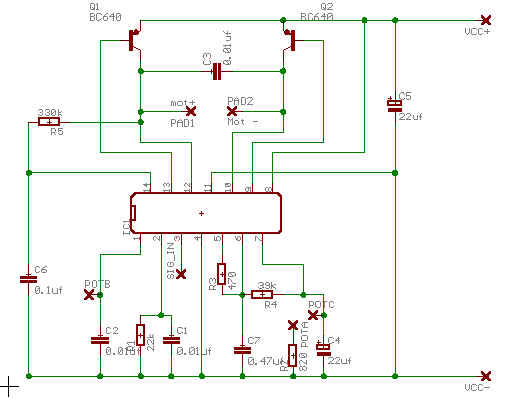 To build this circuit you will need to be able to make Printed Circuit boards, if you can't then you will need to learn how to and set yourself up with the right equipment. Note; This is shown a lot larger than it needs to be the proper size for this is 17 x 16mm. Once you have got the PCB and its components solder in and you have double checked that you do not have anything in the wrong way and that there are no tracks joined as a result of soldering in the components. You can now move on to the hook up to the servo. All of the servo's I have fixed have had a 5k Pot to sense the position of the output shaft of the Servo. The circuit is designed around this and you will need to check that the Pot in your servo is 5k. 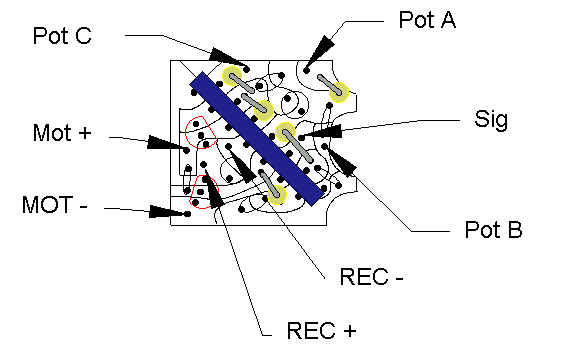 To do this remove the pot from the servo housing and them place a suitable resistance meter across the two outer most terminals of the pot. 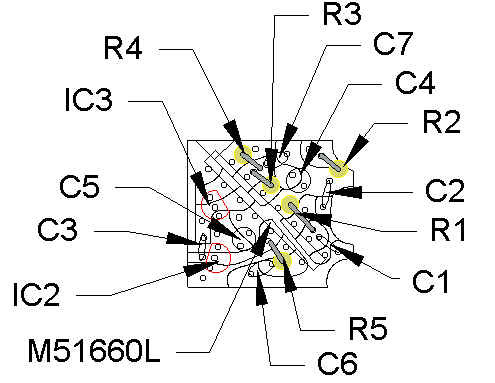 Check the reading, if it does not read around 5k, then you may not be able to use this circuit. I have never had to worry about this, however you can still try it, if it works let me know. Pot A goes to the left hand tag on the back of the pot. Pot B goes to the middle tag on the back of the pot. Pot C goes to the right hand tag on the back of the pot. The only thing that will happen if you get them wrong is that the servo will not respond correctly to your commands and when you power it up it will wind all the way to one side and stay there. If this happens then reverse the connections to Pot A and C and all should be fine. 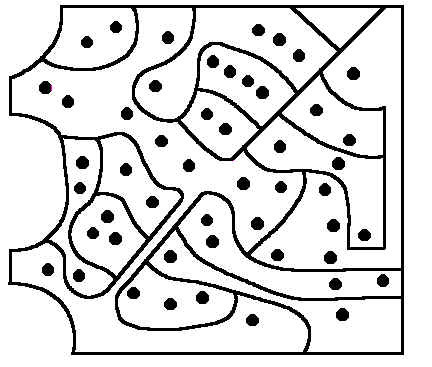 Pot B is always the middle. To hook up the motor + and -, you simply need to look at the back of the servo motor and there will be a red dot on the positive side. Hook this to the Mot + and the other to the Mot -. Some servo's have and additional capacitor across the terminals of the servo motor, you can remove this if you want, the circuit has a capacitor on the PCB to do the same job. Hook up the SIG, Rec + and Rec - wires as shown. Now check that you have not soldered over the tracks and that all components are in the correct spot. Also use a Multi-Meter set at a low Ohmage and test on the backside on the PCB to make sure nothing is shorted out. 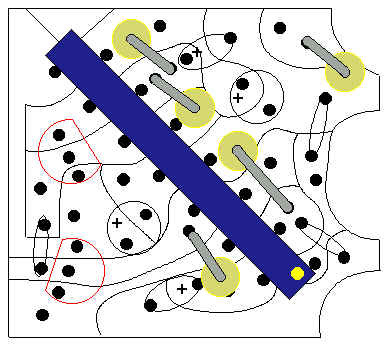 You can use the schematic as a guide to which parts of the circuit should be connected to which other parts. If you get a connection between to tracks, double check everything. Remove all servo drive gears from the servo, making a note of how they came off and where they fit (take a photo if you have a digital camera). This should only leave the drive gear from the Servo Motor and the pot shaft left in the servo. Place the output drive gear on the Pot shaft as it would be normally. Take a spare battery pack and through a connect it directly to the servo. You will need and adapter to do this, I just use short bits of left over wire from the resistors to make the bridge. Please make sure you have the polarity right i.e. ; Black servo wire to the negative side of the battery and the Positive Servo wire to the positive side of the battery. If all is correct the servo should spin a little and then stop. If this does not happen double check every thing again and if it still does not happen, check the signal wire from the servo to make sure there is no voltage on it. If there is you have a problem and you need to check again. If not then you should be safe to plug it into the receiver, as some servo's don't spin when you hook them to the battery. If all is ok then unplug the battery and plug the servo into the receiver and then plug the battery in. If nothing happens except a little spin of the motor then all is fine so far. If something else happens, go back and check again. Now turn on your Transmitter, the servo should start to spin immediately, if it does not turn the output gear all the way in one direction. If the servo starts to spin, all is well, if not then unplug every thing and check again. You will find that if you turn the output gear from right to left, there should be a spot in about the middle that the servo slows down and it should stop. If it does this you have done a great job as this is what should happen. If it does not then you need to go back and check again. If all is ok then you can re-assemble the servo putting all gears back into place and placing the circuit board into the servo case. Make sure that the components on the PCB do not cause the connections to the pot to short out etc. Double check that all is well and then screw the covers back on the servo. It should now look like it is a real servo. After you get the this stage, then replug the servo onto the battery and check that it still move a little. If it does then plug it into the Receiver and attach the power to the receiver, it should move, if it does good, if it does not then check again to make sure every thing is ok. If the servo moves a little and stops, this is good. If it moves all the way around to one side and stops, this is bad. If it does this then the wires on the pot are on the wrong way, you will need to reverse Pot A and Pot C.
If all is ok then move the stick for the channel that the servo is plugged into. it should move and operate normally. if it does not then you have to go back and check. I have repaired 6 servo's this way and they all work and are still working (over 6 months). I would suggest that you take several precautions when you first use your repaired servo. Use it as a Throttle or Flap Servo, for at least if these fail you usually can still fly and land the aircraft. Make sure you test the hell out of it on the ground. I set mine up and use them for a hour or so to make sure I am not going to have a failure. Mark it so you know it was repaired and check its operation more regularly. if you have access to a servo tester use it. I hope this is as of as much benefit to you as it was to me, if you have comments, suggestions or anything else to say about this, please contact me. This information can be used only for non-commercial purposes, it can only be used for commercial purposes with the written approval of the Author. It can be freely distributed as long as reference is made to the author wherever it is displayed or used. The Author takes not responsibility for any inaccuracies in this document and also for any loss, damage or injury the information presented here may cause. If you have a all correction, contribution or suggestion that you wish to share with the Author, please send an email to craig@willingtons.com replies will not be guaranteed.